As many owners are already aware, Beats Headphones from Apple can be the perfect accessory for listening to and watching TV in total privacy, so that you don’t disturb others in the household, and can enjoy the experience all on your own. The superior sound quality of these over-ear headphones make them extremely valuable, and even after a period of usage, they retain significant cash value for someone who might be interested in selling their set of Beats Headphones. Most owners love the fact that these are wireless headphones, which adds to their convenience and mobility, making them even more valuable. If you own a set of these Beats Headphones and find yourself temporarily short of cash, one way of getting past your temporary shortfall would be to pawn your Beats Headphones in Mesa, Arizona at our pawn shop store. Like practically all other Apple devices, these are welcome pieces of gear at our store, because they are in such great demand to others who may be seeking quality headphones without having to pay full retailer price. If you happen to live anywhere in the surrounding region, including such towns and cities as Chandler, Apache Junction, Gilbert, Phoenix, Tempe, or Scottsdale, you are in the broad service area of patrons who frequently visit our store, and whom we are happy and proud to serve regularly. If you’d like to call ahead of time to get some idea of your Beats Headphones’ current market value, you are certainly welcome to do that, and one of our knowledgeable and friendly representatives will be happy to provide you with the information you need. The actual cash payout we are able to give you can only be determined however, with a close examination by our in-house expert, who will conduct his appraisal right in your presence. Once we know the value of your Beats Headphones, we can advance you the cash you need right on the spot and purchase them from you outright, or we can set up a pawn loan agreement with you, wherein we would assume temporary ownership during a term in which you would repay the loan. The loan period would be for 90 days and for each of the months in that term, you would be responsible for paying a monthly installment that is comprised of a principle component and an interest component. While you would be obliged to pay at least the interest part of that installment in order to keep your agreement current and in good standing, the principle portion could be deferred into another month, if you are experiencing ongoing financial difficulty. 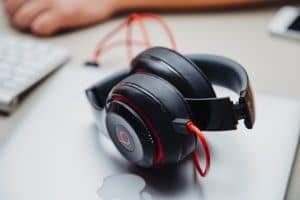 When the pawn loan agreement has been fully repaid, you would be able to take ownership of your valuable Beats Headphones and again enjoy your home listening and viewing experiences. It is our hope that your pawn loan experience with us will prove to be a satisfying and beneficial arrangement for you, so that you will be happy to do business with us again very soon.